Surfer's Cafe invites you to their Old Year's Night Party. 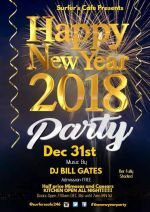 DJ Bill Gates will help you ring in the New Year from 8 pm to 4 am. Half Price on Mimosas and Caesars. The kitchen will be open allllll night long with complimentary Tea, Coffee or Juice with all breakfast orders New Year's morning. Surfer's Cafe will be open from 7:30am on Dec 31st until 7am on Jan 1st 2018. So where ever you may party, or where ever you may roam, Surfer's Cafe will have you covered when that early morning hunger hits!